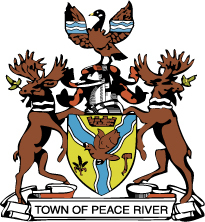 On July 1, 1967, Bylaw 762 was passed authorizing the adoption of a crest and coat of arms for the Town of Peace River. Former Mayor, E.R. Whitmey (1965-1971)was instrumental in the development and adoption of this crest and coat of arms. From the middle of the 12th century onward as a practical and vital means of identification on the battlefield and in the tournament lists, knights wore a distinctively coloured coat over their armour. This was called a “Coat of Arms”. These colours were also displayed on the shields, flags or banners, and even on the horse cloths. A personal crest made of light wood or leather was worn on top of the helmet, and a silk mantle was hung from it to keep the sun off the helmet. This was held in place by a circular wreath of twisted silk cord. In displaying the shield, supporters may be granted. Usually there are two supporters, although in rare cases a single supporter is used. Civic status is depicted by the use of a mural crown, and rivers by wavy lines. Blazoning is, to describe in technical terms, the details of the Coat of Arms. The wording used is a mixture of English and old French and not only gives the colour of the detail but also its exact location. Vert a Pall wavy Argent thereon another wavy Azure over all a Dove volant in the beak a sprig of Olive between in chief a Mural Crown in the Dexter flank three Ears of Wheat stalked and leaved and in the sinister flank a Tomahawk contourney, all Or. On a wreath Argent and Gules A Canada Goose wings elevated and displayed proper Murally gorged on each wing charged with a Bar Barry wavy of four Argent and Azure. On either side a moose regardant proper, attired and unguled. Or, collared gemel wavy argent, in the mouth a branch of olive fructed proper. The field of the Shield is green, which represents the fertility of the area. The wavy silver and blue lines represent two rivers joining to become one (the confluence of the Smoky and Peace Rivers), the mural crown civic status, the dove over the river symbolizes peace thus Peace River. The tomahawk alludes to ancient troubled past and the three ears of wheat to modern peaceful agricultural pursuit. A Canada Goose open winged with wavy lines of silver and blue with a mural crown around its neck, representing a town in Canada located on a river. Moose (indigenous to the area) with wavy lines around the neck representing the river and an olive branch in fruit in its mouth, representing peace, hence Peace River. The Town of Peace River would like to thank Diane Gayton formerly of the Peace River Centennial Museum & Archives (1946-2004) for providing the Town with the information regarding the components of the crest and coat of arms.